This was freaking hilarious. But I’m not sure I can adequately describe what happened in order to do it justice. As you may recall, I sent out a Brushfire Alert on Sunday letting everyone know that I was driving up to Carson City on Monday to hand-deliver the “Ax the Tax Now” petitions that over 800 of you signed. Again, I’m not known as the #1 Irritator of Liberals for nuthin’! 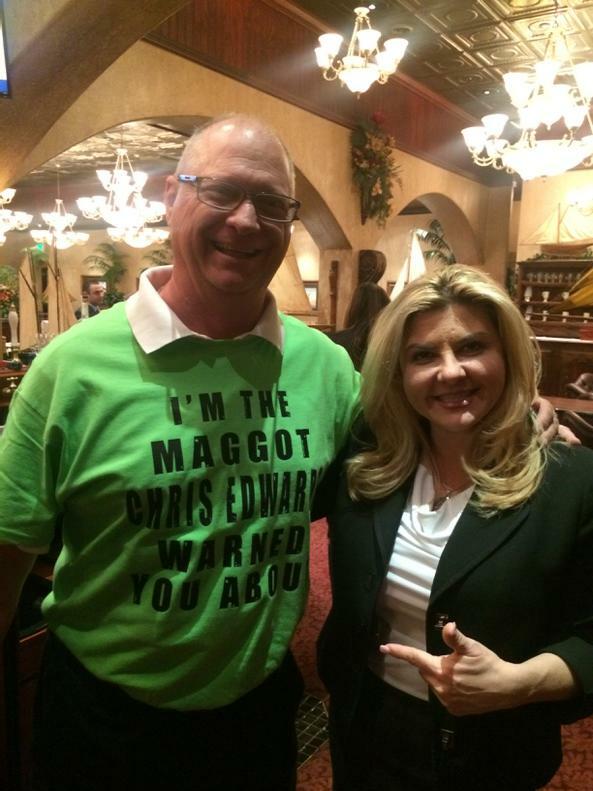 So naturally I immediately went out and bought a t-shirt that read, “I’m the maggot Chris Edwards warned you about” and wore it while I was at the Legislature. I stopped by Assemblywoman Michele Fiore’s (R-Clark) office up on the fourth floor to drop off the petition. And Fiore’s office is right next to Edwards’ office. At the time, Edwards was in the Ways and Means Committee room directly across the hall. And there’s a back door from which legislators can exit the hearing room. To get to his office, Edwards has to walk out of that back door, turn right and walk past Fiore’s office. So as luck and divine providence would have it, just as I’m leaving Fiore’s office wearing my “maggot” shirt, Edwards emerges from the back door while talking on his cell phone. He turns right to head for his office…and sees me! Folks, the look of horror on his face was pure gold. It was like he suddenly and unexpectedly walked into a really stinky fart. The drama queen then stumbled backward a half-step, almost tripping, and then bee-lined it in the other direction down the hall. Others standing next to me witnessed the whole thing. We all just burst out in laughter! Funniest thing I’ve seen in quite a long time. Leading to this question: If the Legislature installs a transgender bathroom in The Building, which one would Edwards use?